Cloud computing is an innovative methodology that combines hardware, network, storage, and software to deliver computing resources as a service over the internet. With the ability to scale resources and automatically provision and de-provision services, cloud computing leverages resources to offer greater value to business procedures. 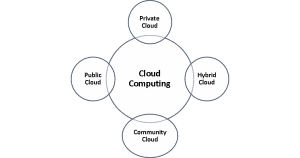 Cloud computing offers different deployment models such as Private Cloud, Public Cloud, Hybrid Cloud, and Community Cloud. Public Cloud: The whole infrastructure is managed by a cloud computing company that offers the cloud service. The customer has no physical control over the infrastructure which is shared with other customers or organizations. Private Cloud: Using dedicated, private hardware, a private cloud is used solely by one customer or organization. It is not shared with others, yet it is remotely located. Hybrid Cloud: The use of both private and public clouds, depending on the customer or organizational requirements and purpose. For example, a public cloud can be used to deliver applications that required elastic scalability, while processing sensitive data is done through a private cloud. Community Cloud: An infrastructure shared between organizations that require an extra layer of protection over the data. For example, a community cloud can belong to a government of a single country. The most significant benefit of any type of cloud computing is reduced IT costs. Businesses try to minimize capital and operation expenses, and with cloud computing, there is a reduction in capital costs from server hardware and software and reduced complexity. With public cloud computing, a ‘you-pay-for-what-you-use’ method allows for scaling up or down of infrastructure, reducing concerns about IT investments. It also removes the associated operational costs of on-premises infrastructure such as power, air conditioning, and administration. People tend to think that only large businesses can afford cloud services, however, they are incredibly affordable even for the smaller businesses. A managed service platform makes public cloud computing more consistent and reliable than on-premise deployment. Most providers offer 99.99% reliability and 24/7 availability with their SLAs. Organizations can benefit from redundant IT resources and flexible failover mechanisms—if a server fails, hosted applications and services can quickly switch over to any available server. Through the central administration of resources, cloud computing provides enhanced and simplified IT management and maintenance capabilities. Updates and maintenance are no longer needed, as the service provider maintains all resources. Access to software, applications, and services is managed through a simple web-based user interface, without any installation. Additionally, you have an SLA guarantee of on-time delivery, management, and maintenance of IT services. With computing resources continuously increasing, organizations gain a competitive edge over competitors when they can reduce the time required for IT handling to virtually zero. Organizations can deploy applications that deliver business benefits without upfront costs and with minimal provisioning time. By enabling you to put technology aside and focus on your key business activities and objectives, cloud computing assists in reducing the time needed to promote newer applications and services.